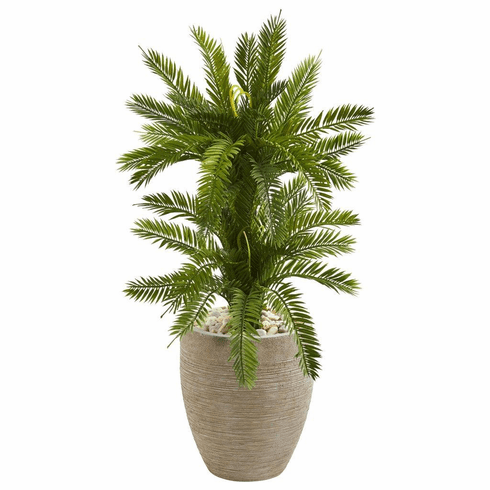 Coming in a sand colored planter, the artificial double cycas plant stands at a height of 3 feet. Sporting two heads of vibrant, dense greenery, this faux plant will accent any neutral-toned bedroom, living room, or dining room. To give your bedroom a natural touch, position this piece on either side of your desk or vanity. On those furniture pieces, be sure to include white or brown trays, vases, or other potted greenery for a full arrangement. Height: 3 Ft., Width: 21 In., Depth: 21 In., Color: , Pot Size: H: 12 In. W: 11 In. D: 11 In.